Just because you don’t care about college hockey, doesn’t mean we don’t! Clu is here with his frost brewed stlylings. After searching for things to really dive into for the month of March, and realizing that there are simply just too many D-I conference tournaments that were taking place this week in college basketball, I decided to change course and dive into unfamiliar waters. 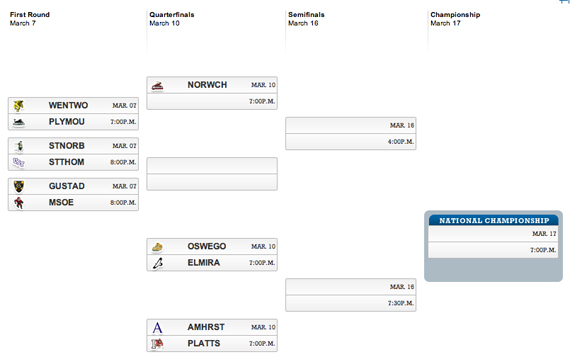 I decided to look into the realm of college hockey, where I discovered the Division III NCAA tournament starts tonight! On top of that, it’s full of local colleges, including my Alma mater. Many people have asked me, why even bother with these schools? They’re division III! My answer to that is simple: I was bored. So, for all of you who are alumni of, or current students at, the schools in the SUNY (State University of NY), Boston, New Hampshire and Minnesota school systems, you’re in for a real treat. Enjoy! This year’s tournament contains eleven teams. Five of those teams received byes into the quarterfinals (four conference winners, one “at-large” bid). The remaining six teams (five conference winners and another “at-large”) are left to duke it out in the first round if they want to move on. Each round of the tournament is, of course, single elimination, with the winner advancing to the next round. Plymouth State, which is out of the Massachusetts State Collegiate Athletic Conference (MASCAC), won its first MASCAC title in a double-OT thriller over Salem State University 5-4. This happens to be the the first conference title that the Panthers have won in their 40 year history. The Panthers will ride their automatic bid to the NCAA tournament, where they hold a nine game unbeaten streak (8-0-1). Their opponents, Wentworth Institute, claimed their fifth East Coast Athletic Conference (ECAC) Northeast crown (and first since 2004) with a 1-0 overtime victory. When: March 7th, 8pm @ Cornerstone Community Center, Green Bay, WI. In what appears to be a battle of two great midwest/northern colleges, the St. Thomas Tommies take on the St. Norbert Green Knights. The Tommies (yes thats right, folks the TOMMIES!) happend to have the best conference record in the Minnesota Intercollegiate Athletic Conference (MIAC) but wound up losing in an upset to St. Olaf. However, they managed to get an automatic bid anyway. 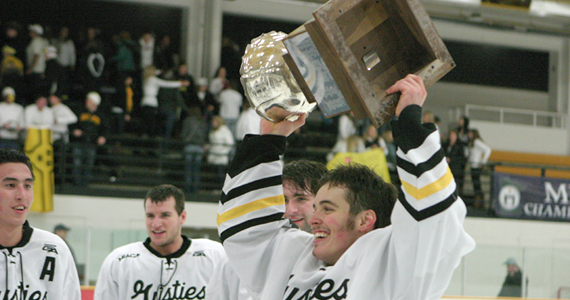 The Green Knights of St. Norbert, meanwhile, won the Northern Collegiate Athletic Association (NCHA) title. Come on down to Green Bay, WI and cheer on St. Norbert at the local Cornerstone Community Center! You can’t miss it! It’s located next to the Green Bay Tennis Center and the local National Storage Systems Center! When: March 7th, 8pm @ Don Roberts Ice Rink, St. Peter, MN. In this game, we have the Raiders of Milwalkee’s School of Engineering, who came out of the Midwest Collegiate Hockey Association (MCHA) by beating #1 seed Adrian College 4-3 in OT. On the other side of Minnesota, we have my personal favorite (upon discovering the name of the school mascot), the Gustavus Adolphus College Golden Gusties. The Gutsies only had a 8-5-3 conference record, but due to some crafty work against in-conference rivals, they managed to pull off the unthinkable and…win the whole effin’ MIAC tournament These Golden Gusties are pretty solid too. They know how to win at home and on the road, so it will be interesting to see how they match up against Milwalkee. When: March 10th, 7pm. @ Campus Center Arena, Oswego, NY. Elmira College happens to be in the home town of the Elmira Express, aka Ernie Davis, the legendary Syracuse running back who helped then Orangemen win their first and only national championship in 1959. Ernie also became the first black player to win the Heisman Trophy. So What does this have to do with the Soaring Eagles? Nothing, so let’s move on from this history lesson. 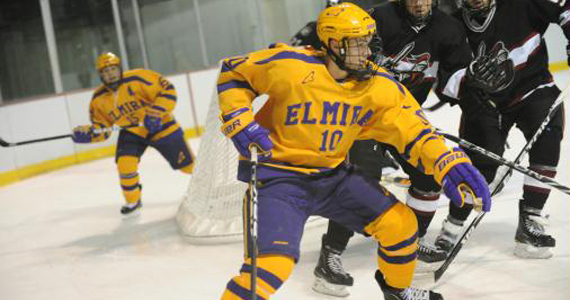 Elmira finished the regular season 15-8-3 overall, with a 8-2-2 record in the ECAC West conference. This was good enough for them to earn their fifth consecutive appearance in the NCAA Tournament… not too shabby! They face a tough Oswego State (my Alma mater) Lakers team who is currently ranked first in the Division III USCHO poll. 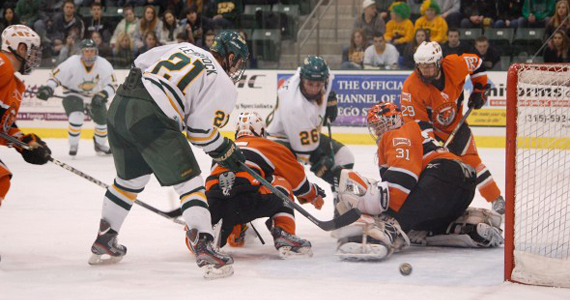 After winning the regular season SUNYAC conference and going undefeated in the conference (14-0-1), Oswego State enters the NCAA tournament as the other “at-large” bids (they lost the conference tournament finals to Plattsburgh State). When: March 10th, 7pm. @ Orr Rink, Amerherst, MA. As previously mentioned, Plattsburgh State won the SUNYAC tournament finals over their arch-rival Oswego State, which was a very bitter win for me to swallow. Nonetheless I have faith that Amherst, winner of the NESCAC (New England small college athletic conference), will right that wrong, because they are clearly the better team in this matchup. Amherst is also playing on their home ice. Part of me wants the upset here, because I want to see the rematch between Oswego and Plattsburgh in the semi-finals in Lake Placid. That would make for one hell of a Frozen Four, D-III style! I hope that I might have broadened you’re horizons into the Division III hockey world. I will continue to monitor these tournament games, and give everyone the blow-by-blow for the next few weeks. Will you care? Probably not since March Madness will be in full swing, but I’ll have some coverage for that coming up next week too!